In our medical weight loss program our philosophy is that eating a little bit of everything in moderation is the key to successfully losing weight and keeping it off. When people try to stop eating a certain type of food, often times they will lose weight quickly but when they start eating that particular food again they gain all of the weight back. That’s why in our weight loss program we allow you to eat almost every type of food group and we teach you what the best choices are from each food group. The appetite suppressant medications do a wonderful job of decreasing your appetite but you still have to eat and make the proper food choices. That is why we spend so much time reviewing good healthy nutrition with you and it’s also the reason why we are constantly updating this website with great recipes for all different types of food. 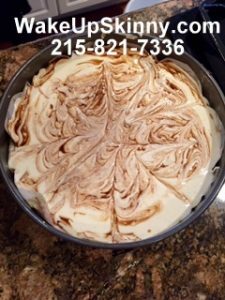 And today, I’m going to give you a great tasting low carbohydrate recipe for cinnamon swirl cheesecake. This recipe will give you a cake that you can cut into 12 servings. Each serving will have 12 g of protein, 6 g of carbohydrates, 250 cal and 1.2 g of fiber. Please use a 8 inch spring form pan for this recipe. First preheat the oven to 325°F and spray and 8 inch spring form pan with nonstick cooking spray and line it with baking parchment paper. To make the crust first brown the butter by putting it in a saucepan and heat over medium – high heat, stirring frequently. When the butter finally starts to phone and has brown flex remove it from the heat and let it cool down for approximately 11 minutes. After it has cooled add the chocolate to the butter, stirring it continuously. Once the chocolate is melted stir in the erythritol and Stevia. When everything is mixed nicely let it cool in the refrigerator. Once this has cooled down in the refrigerator you can add the egg, salt, vanilla extract and cinnamon. Mix everything together nicely and then pour this mixture onto the parchment paper that is lining the bottom of your springform pan. Then spread this evenly over the entire bottom. To make the filling and able mixed together the cream cheese, Stevia, almond milk, erythritol, vanilla extract, almond extract and the salt until everything is mixed together nicely. You can use a hand-held mixer or a stand mixer for this process. Next add the eggs one by one while you are mixing the batter on low speed. When you have added and blended in all three of the eggs pour half of this mixture into your springform pan. You are pouring this over top of the crust. To make the cinnamon swirl heat the butter in a saucepan and start continuously until the butter starts to phone and those beautiful brown flex appeared. Then stir in the vanilla extract, cinnamon, salt, Stevia and erythritol. When everything is combined nicely with remove it from the heat and let it cool down a bit. Next spoon half of the cinnamon swirl on top of the cheesecake mixture that is already in the spring form pan. Now take a nice and twirl in this cinnamon swirl through the cheesecake batter to give it that marble look. Make sure that you go deep into the cheesecake batter because you want the cinnamon swirl to spread all the way to the bottom of the cake. Then over that pour in the rest of your cheesecake mixture and cover with the cinnamon swirl topping once again and then mix in with a knife for that marble effect. Now you have to set up a water bath. Wrapped heavy-duty aluminum foil call you around the bottom and along the sides of the springform pan. We do this to prevent the water from leaking into our cake. Then place the cheesecake in any type of baking pan with sides and place the pans into your oven. Then pour hot water into your roasting pan until it comes halfway up the sides of your springform pan. Let this speak for approximately 50 minutes or for as long as it takes until the center is almost set. Then remove it from the oven and let it cool down completely before removing it from the pan. Then let it sit in your refrigerator for at least 5 hours before serving. We have made this recipe quite a few times and I have eaten it before letting it cool down for five hours in the refrigerator and I have also eating it after we have let it refrigerate overnight. And I can tell you from my personal experience that it tastes much better when you let it refrigerate overnight. I hope you enjoy this recipe is much as I do. At least once a week we update this site with new delicious recipes that are going to be low-calorie and/or low-carb – low sugar. So please visit the site at least once a week. If you need help with your health and wellness or even losing weight call us and schedule your free consultation at 215-821-7336. This entry was posted in Diet Doctors in Philadelphia, Medical Weight Loss, Medical Weight Loss in Philadelphia PA and tagged 39.9500° N 75.1667° W, diet pills Philadelphia, doctors prescribe phentermine Philadelphia, medical weight loss bucks county pa, medical weight loss doctors Philadelphia, Medical Weight Loss Philadelphia, phentermine in Philadelphia, philadelphia diet doctors, philadelphia weight loss doctors, vitamin B12 injections Philadelphia, weight loss philadelphia, weight loss pills philadelphia, weight loss programs Philadelphia on September 19, 2016 by Dr. Michael Kenny.